Vivo has introduced Vivo Y83 which is the first smartphone powered by MediaTek Helio P22 Processor. 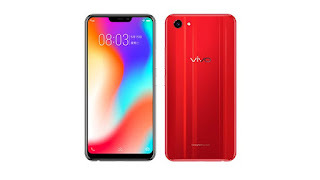 Vivo Y83 has a 6.22-inch display with 19:9 aspect ratio, resolution of 1,520 x 720 pixels. The handset offers a mirror finish, which was achieved using a new high-gloss coating technology. Vivo Y83 is powered by 2.0GHz MediaTek Helio P22 processor with 4GB of RAM and 64GB of storage which is further expandable up to 256GB with a microSD card. Dual SIM device runs on FunTouch OS 4.0 based on Android 8.1 Oreo and also offers Face Unlock functionality. On Camera, it has a 13MP rear shooter with f/2.2 aperture and a LED-flash and 8MP front-facing camera. Packed with a 3,260mAh battery. Vivo Y83 comes in Aurora White, Polar Black and Red color priced at 1,498 Yuan and comes bundled with a free protective case and a set of earphones.